Perch Plans by Tim Brown Architecture is thrilled to announce that they have released their second flight of architectural plans, expanding the variety and style of designer home plans available for clients looking to build a semi-custom home. Each flight, or collection, features four to six limited edition tailored home plans crafted in a central architectural style – with the latest collection, “Maison Provincial,” inspired by the homes of the European countryside. 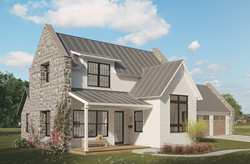 Launched in 2016 by Austin architect Tim Brown, Perch Plans offers a boutique home plan shopping experience that makes high-end residential architecture readily accessible for someone looking to build a semi-custom home. Ranging in size from 1,968 to 3,423 square feet and priced between $2,600 and $4,200, the Maison Provincial designs were created to appeal to a wide array of homeowners with varying family needs and land restrictions. The four new plans in the Maison Provincial flight, which is French for “provincial house”, evoke a spirit of humble French cottages and stately English manors but are updated with modern components and amenities. Home plans in the Maison Provincial flight feature three and four bedrooms, and are carefully crafted with aesthetic, flow and efficiency of space and energy in mind. Every Perch Plan is exclusive by zip code and is fully customizable, so buyers have access to homes that are truly tailored to their lifestyle and unique to their area. Each curated design is made from hours of thoughtful planning and creative effort; and by starting with a good framework, tweaks can be made to the preformed concept to make it unique to the individual client. As a project of Tim Brown Architecture, Perch Plans has a team of licensed and experienced architects that will work with buyers directly to make modifications based on their particular needs. “We wanted to create a better process,” said Brown. “Perch Plans gives everyone the chance to work directly with the creating architect, and design guidance that follows each homeowner’s specific situations.” It’s out of this passion that Perch Plans was created to be an elevated alternative. With a streamlined system for customers to purchase the plans directly from the Perch Plans website at an affordable price, Brown is putting quality, comprehensive design within reach of more people, while still maintaining the personal and approachable feel of a custom project. To see the available house plans and learn more, visit http://www.perchplans.com. Tim Brown Architecture was formed in 2009 by Architect, Tim Brown. After many years of working in residential architecture, Tim wanted to explore a more comprehensive approach to design that included all the qualities a home should possess. Aesthetic beauty, energy efficiency and a custom fit for the homeowner are at the forefront of every one of the homes he designs. Brown began his career as a custom residential architect in 1998, and launched Tim Brown Architecture in 2010, before starting Perch Plans in 2016. With 20 years of experience behind him, Brown can offer a level of skill, knowledge, and personalization that can’t be found in other online house plan purveyors. Tim attended the University of New Hampshire and Texas A&M University. He is a licensed Architect in several states, is a member of the American Institute of Architects and is LEED and BPI certified.